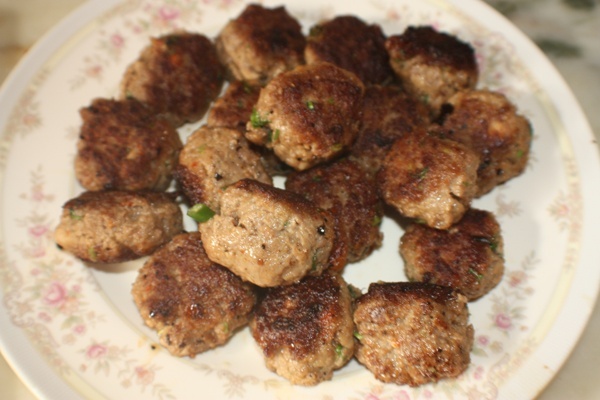 For the Meat balls : In a large bowl,mix all the ingredients for the meat balls and combine it well. Make 15-16 lemon size balls and keep aside. In a non-stick pan, add 1 tbsp of oil and pan fry the meat balls in batches. 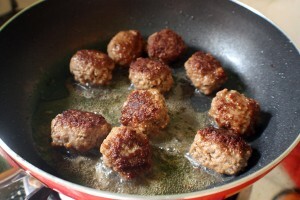 The meat balls have to be lightly browned on the outside. It does not have to be cooked fully as it will be cooked again in the gravy. Pan fry all the meat balls and keep aside. Heat oil in a pan and add the cumin seeds and chopped green chillies. Add the onion and ginger garlic paste until it changes color and become slightly brown. Then add the tomatoes, coriander and cumin powder, chilli powder, turmeric and salt. 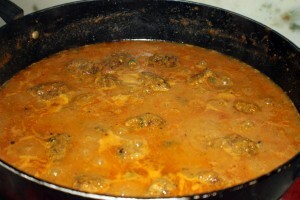 Mix well and cook till the tomatoes become soft and mushy and the oil starts separating from the masalas. Now add the boiled chickpeas and mix it well so that the chickpeas are nicely coated with the paste. Fry for 5-10 mins. Add the coconut milk,. 1/2 cup of warm water and bring to boil. Turn down to simmer and slowly drop the meat balls in the gravy. At this point, do not stir the meat balls as they might break. Hold the pan from both sides and slowly shake the pan in circles so that the meat balls mix well in the gravy. This way the meat balls will not break. Simmer and let the meat balls cook for 10-15 mins. Add a bit of warm water, if the gravy starts drying up. 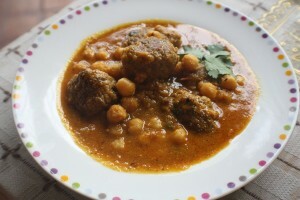 Serve hot with Roti or home made Naan. 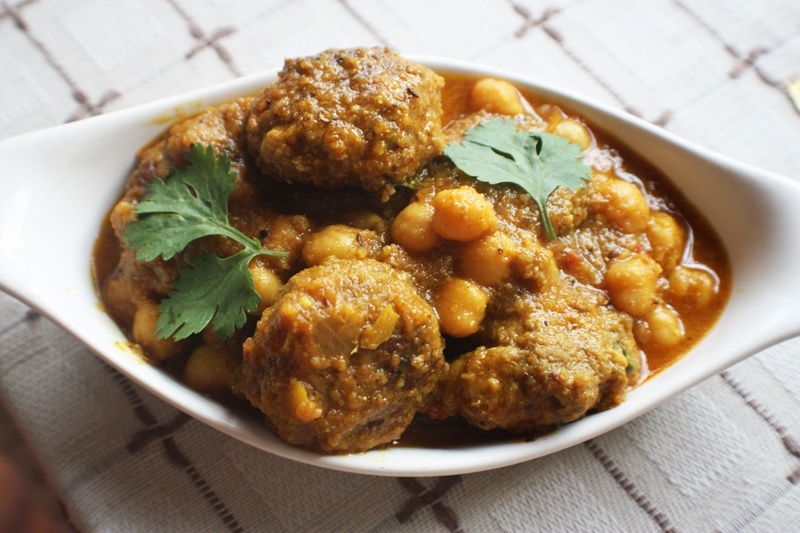 This entry was posted in All Recipes, Chicken, Mutton, Pork, Pulses & Beans and tagged Meat balls & Chickpea Curry by Kamakshi. Bookmark the permalink. Great simple and super tasty recipe. Nice one! Thanks for sharing! This site is very useful for everyone . thanks for these tasty recepies ..